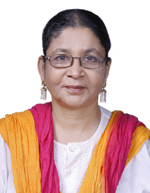 Subhadra Mitra Channa did her Ph.D. in Social Anthropology from the Department of Anthropology, Delhi University. She is presently a professor at the Department of Anthropology, University of Delhi. She has been a Fulbright Visiting Lecturer to the Auburn University, USA in 2003, a Visiting Professor to the Maison de Sciences l’Homme in Paris and at many Indian universities. She was the President of the Indian Anthropological Association for five years and has been the editor of the Journal of Indian Anthropologist, since 2000. She was a Scholar-in-Residence, for the teaching year 2008–2009, under the Fulbright programme at the University of South Carolina, USA, where she taught among other courses, one on Ethnicity and Race. She is also the Chair of the Commission on the Anthropology of Women, an international body and part of the International Union of Anthropological and Ethnological Sciences (IUAES). She was earlier Co-Chair along with Professor Faye Harrison (Chair) up to 2009. Her research interests focus largely on Dalits, gender, religion and cosmology, world view, and identity.